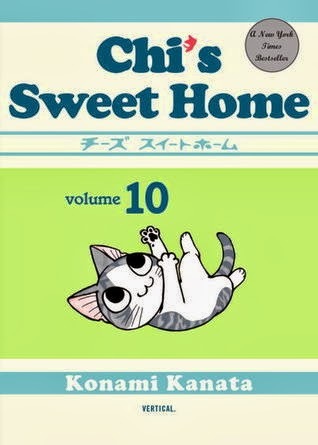 Chi meets some new kittens and gets lessons from Auntie Calico and Blackie in Chi's Sweet Home Volume 10. 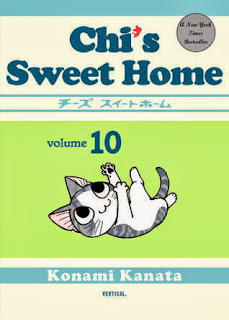 Note: Chi's Sweet Home Volume 10 is, of course, part of a series. Check out the review of Volume 1 here, or the review of Volume 9 here. Otherwise, read on! After Cocchi experiences firsthand the type of place Chi calls home, Cocchi heads back to the park to play. Hey look, there's Chi! But maybe not Chi after all. Who are these two new kittens that look so much like Cocchi's friend? Even though Chi lives indoors, it's not always so easy. The more Chi plays with the other cats in the neighborhood, the more she realizes that the Yamadas aren't like her. They don't have tails, for one. And it's only Chi that doesn't understand what they're saying. Maybe Mommy isn't the same mommy Auntie Calico is talking about. Daddy Yamada might have the hardest dilemma of all. While out for a walk, he comes across a very peculiar sign. It looks like Chi had a human family before the Yamadas, and they've put up Lost Kitten posters. How can Daddy break this news to his family and does this mean they might have to give Chi up after all? Chi's Sweet Home often has a melancholy or nostalgic tone, and this volume is no exception. As Chi gets older, she'll be spending less time at home with her family and more time exploring the world outside. Hopefully, she'll remember that home is where the people who love you best are, and no matter how far she roams, the Yamadas will always be there with a saucer of milk at the end of the day. Highs: I wish my neighborhood park had roving packs of kittens. Lows: Poor Chi is having such an existential crisis throughout this volume; I wish we had more happy playtime chapters to even it out. Verdict: Still a very high-quality title.